Hust and Rodgers talked to adolescents before the start of the #MeToo campaign. The researchers noted that the young women they spoke with shared stories similar to those shared on social media as part of the grassroots campaign. “Even most of our youngest female participants, who were freshmen in high school, had already experienced some form of sexual harassment,” Hust said. The young women viewed such sexual harassment as normative, Rodgers said. Book shares adolescents’ and young adults’ stories related to media, gender stereotypes, virginity, romantic relationships, sexual activity and dating violence. “Our qualitative data suggest that adolescents and young adults identify a pervasive sexual double standard in which boys are rewarded for sexual aggression and girls are shamed for sexual agency,” Rodgers said. Some of the men Hust and Rodgers spoke with in their interviews rejected these gender stereotypes and said they wouldn’t comment on a woman’s body. “Others, however, didn’t seem to understand that such comments could be unwanted,” Rodgers said. Such gender stereotypes affect how they interpret sexual media content and how they act in their romantic and sexual relationships, Hust said. “The information we gathered in our focus groups and in-depth interviews support what we have found in our surveys of young people,” Hust said. Hust’s and Rodgers’ previous studies of young people have consistently identified a relationship between young people’s perceptions of media content and their intentions to have healthy sexual relationships. The authors’ found women who believed in gender stereotypes and endorsed music that degraded women were significantly less likely to engage in healthy sexual consent negotiation. In another study, Rodgers & Hust found women who accepted the sexual objectification of women and who found music videos as entertaining were more accepting of sexual comments about their bodies. Further, young women who accepted female objectification and viewed music videos as realistic were more accepting of unwanted physical sexual harassment (i.e. being touched or grabbed). 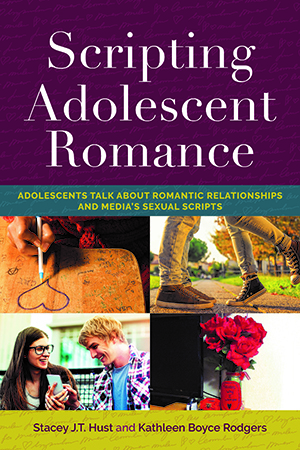 Hust and Rodgers report their findings in a book titled “Scripting Adolescent Romance: Adolescents Talk about Romantic Relationships and Media’s Sexual Scripts,” by Peter Lang Publishing Group. In addition to sexual harassment, the authors share adolescents’ and young adults’ stories related to media, gender stereotypes, virginity, romantic relationships, sexual activity and dating violence. Hust and Rodgers will present an overview of their findings March 26-27 at WSU’s annual Murrow Symposium.